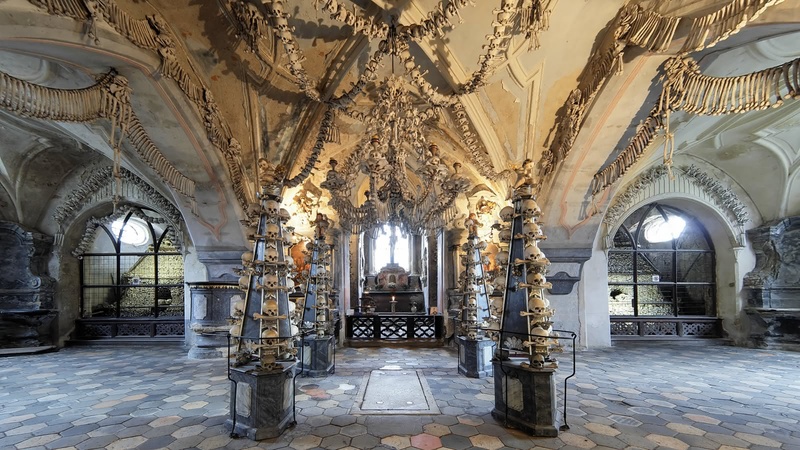 This day trip to Kutná Hora will take you to the famous bone chapel and show you many other places you would have missed on your own. This gem of Bohemian history lies just an hour outside of Prague and is home to much more than pyramids of skulls and bones. The city center has been a UNESCO World Heritage Site since 1995. This day trip from Prague to Kutná Hora meets in front of the Cartier store and the Czech tourism office on Old Town Square. Your tour starts with your expert local guide taking you on a private bus from Prague to Kutná Hora. 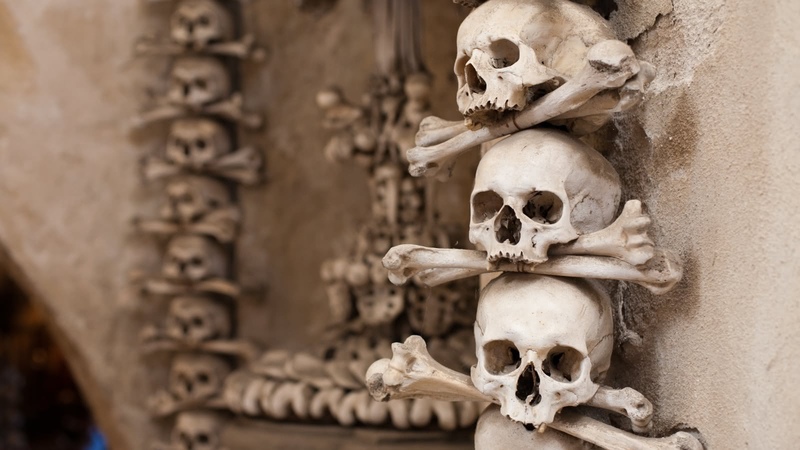 You'll visit the Sedlec Ossuary (also known as the Bone Chapel) which draws visitors from all over the world who come to see the tens of thousands of human skeletons that decorate it. 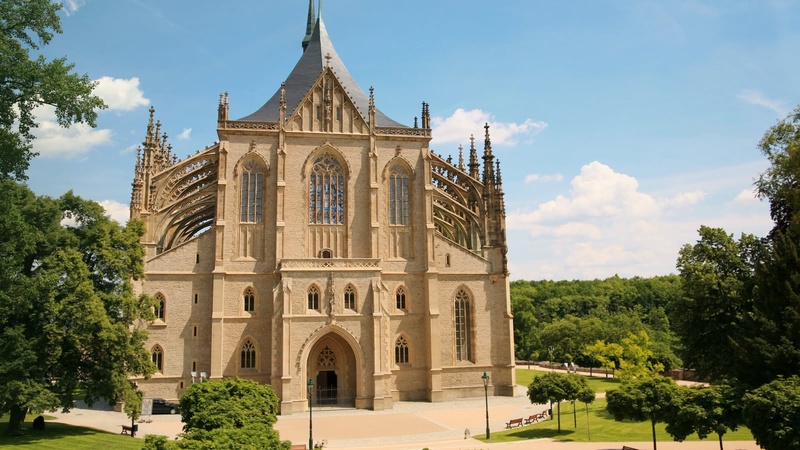 However, there is much more to see in Kutná Hora than just the Bone Chapel, as this tour takes you to one of the Czech Republic's oldest monasteries, to the gothic masterpiece Saint Barbara's Church, and much more. The historical town center of Kutná Hora is so impressive that it is a UNESCO World Heritage site. On your tour to Kutná Hora, you'll see the the splendour of the Italian Court (the Royal Mint), some of the most impressive gothic buildings in the Czech Republic and you'll understand why several Bohemian kings made the town their home. We've made the day trip to Kutna Horá as easy for you as possible, picking you up from the Prague city center in the morning and returning there at the end of the day. No chance of getting lost, getting on the wrong train or buying the wrong ticket - this private bus is chartered solely for the SANDEMANs Kutná Hora tour guests. We had a wonderful trip to Sedlac and Kutna Hora with our guide Brandon Duke. We saw the ossuary in Sedlac, St. Barbara's in Kutna Hora, and learned about how silver had transformed this part of Bohemia. Brandon's knowledge of the sights and history, combined with a fun and engaging personality and sense of humor, made this a delightful day trip. I highly recommend it, and hope you're lucky enough to have Brandon as your guide! We had an awesome time. We really enjoyed the Bone Chapel & St Barbara's Cathedral. Neil our English speaking tour guide was outstanding. We booked the Kutna Hora day trip because of Neil. We had him the day before on the free walking tour, and enjoyed him so much, we decided to book the day trip as long as he was going to be our guide. You can tell he really loves his job!!! The tour included a bus ride to and from Kutna Hora and our admission fees (lunch was not included). Andy was a wonderfully knowledgeable and approachable guide, and his enthusiasm was infectious. He nicely summed up hundreds of years of complex history. I really loved the stories of all the saints. 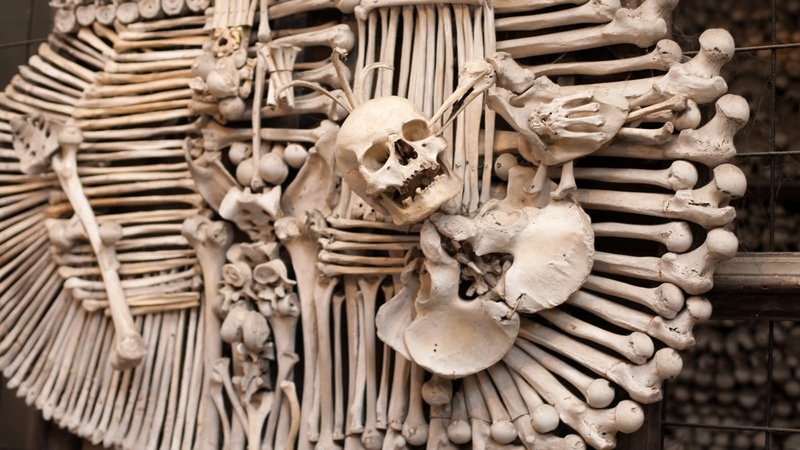 The Sedlec Ossuary (Bone Church) is very creepy and a can’t miss. Lunch at Dačicky was delicious and actual traditional Czech food. Day trip to the Bone Church and Kutna Hora was amazing! Our guide Ryan was knowledgeable, entertaining, and so patient. We never felt rushed and he pointed out some amazing details we surely would have missed as well. I traveled with a large family and he was so accommodating. The entire day was very well coordinated. For lunch he recommended a restaurant and it did not disappoint! What a great day trip! Thank you Ryan! Beautiful day out in the fairytale town of Kutna Hora. Andy was a great host and the day flew by. The bones are a must see for anybody, highly recommend, thanks Sandemans.